Sweets lovers don’t have to search hard for the perfect candy while visiting the Centennial State. From decadent chocolate shops to handmade taffy and toffee, these candy shops became the best in Colorado due to perfectly-crafted recipes made from the best ingredients. Expect the best taffy, handmade truffles and one-of-a-kind spun ribbon candy at these nine best candy stores in Colorado. Founded in Grand Junction, this family-owned candy shop has been open for more than 40 years and now has five stores in Colorado. Enstrom Candies grew famous for its almond toffees. Now however, the shop makes not only toffees but also decadent chocolates, truffles and toffee popcorn. Even if you aren’t located in Colorado you can enjoy Enstrom’s. This shop ships to all 50 states and more than 40 countries. The peppermint cookie bark is a popular treat during the holidays but don’t leave this shop without trying the chocolate almond toffee. Georgetown Valley Candy Company is a family-owned business that specializes in making handmade caramels, popcorn and chocolates. The caramel corn, which can be made mixed with chocolate, pecans or cinnamon, is a popular delicious snack. Even those seeking a sugar-free treat will find something at this loved candy shop. This highly popular chocolate shop is one of the most well-known shops that have come out of Colorado. Based in Durango, Rocky Mountain Chocolate Factory has expanded to numerous shops in Colorado, the country and even the world. You will find a variety of candies at this shop, including fudge, English toffee, truffles, caramel apples and nut and chocolate clusters. Find handmade truffles at Telluride Truffle that are made with organic Colorado cream and Belgian chocolate. Located in the beautiful mountain town of Telluride, the truffles made at Telluride Truffle are inspired by the mountain scenery. With names like “Snow Capped” and “Mud Season,” along with the peak-shaped truffle that resembles a mountain, this candy shop is truly a Colorado treasure. Try the champagne truffles, infused with real champagne, or taste the Alpenglow truffle flavored with cabernet sauvignon. Hammond’s Candies has been creating delicious candies since 1920. Chocolate lovers and candy feigns will both find a special treat at Hammond’s. Try the uniquely flavored chocolate bars like a s’mores bar or red velvet cake bar. One of the most popular items at Hammond’s however is the oversized candy canes and spun ribbon candy. Take the free tour around the factory to see the candies being made and packaged by hand. The chocoholic will love venturing into Piece, Love & Chocolate in Boulder. This candy shop specializes in chocolate candies and pastries. Find truffles, bonbons and bars, along with cupcakes, brownies and even coffee and hot chocolate at this choco-centric candy shop. The next time you are in the town of Ouray, which is known as the “Switzerland of America,” visit the cute, little chocolate shop Mouse’s Chocolates. The mouth-watering candies here include toffee, caramels and other chocolate goodies made from fine Belgian chocolate. Don’t leave without trying the chocolate-covered coffee toffee. Salt-water taffy lovers must visit the Taffy Shop in Estes Park. Even those who think that they don’t like taffy will find a taffy flavor to enjoy at this candy shop. The freshly-made taffy made at the Taffy Shop, which is so fluffy and soft, has been pleasing candy lovers since 1935. 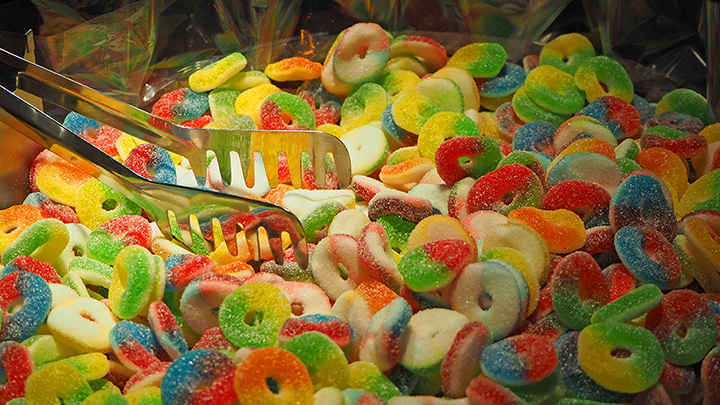 Find your favorite candy from your childhood or discover a new candy to tickle your taste buds at Scrumptious. Candy isn’t just sold at Scrumptious, however. Grab a unique soda or made-in-house ice cream. This candy shop has such a variety for the chocolate lover to the sour candy addict.